How would you feel if I asked you to talk about how great you are? My guess is, if you’re like the majority of people in the world, you wouldn’t feel very comfortable. According to Dan Schawbel, author of Promote Yourself and Me 2.0, this attitude of feeling ashamed to talk about your success, or ashamed to show people the value you add, will not benefit you in the 21st century. In fact – it’s ONLY those who are willing to tell or show people everything they’re capable of – who are willing to self-promote – that will succeed over time. Because otherwise you’ll be ignored. And if you’re being ignored, someone else will take your spot, your promotion, your pay raise, etc. This is the reality of the modern world and it’s something we need to get used to. That’s why I wanted to talk to Dan today, an authority on the subject of selling your personal value. Dan is the Managing Partner of Millennial Branding, a Gen Y research and consulting firm. 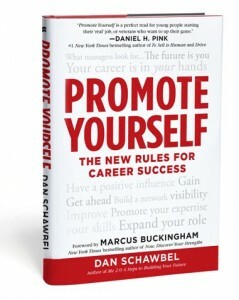 He is also the New York Times and Wall Street Journal bestselling author sof Promote Yourself: The New Rules For Career Success and the #1 international bestselling book, Me 2.0: 4 Steps to Building Your Future. One: he was given nothing – he had to work for everything he has. Two: Dan’s not ashamed to talk about his value or what he’s capable of achieving – and that’s exactly why he’s gotten where he has in life. So check out today’s interview and leave a comment below to let me know what you think!